I used to wonder. What criteria does Silverline's Alan Yun use to determine how to flesh out his product line? You see, he is one of the only manufacturers I know who actively competes against himself! Looking at his $8,000 Bolero [left] and today's $6499 Sonata Mk III [below], one could reasonably ask: Why two speakers so similar? Then there's the $8000 La Folia [right], which sells for the same price as the Bolero but is of radically different design. What's the deal? 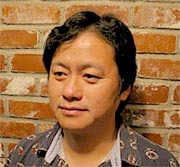 Well, my own observation calls Alan Yun an incredibly talented designer. He knows exactly where he wants to go and doesn't seem to enjoy taking the same exact path twice. Perhaps he reads Heraclitus? Like a talented chef, he also knows how to appease more than one kind of appetite, how to broaden his menu and thus build out his audience. Though very competent, these drivers also cost far less than many better-known drivers. 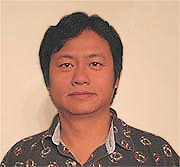 Thus, Yun can bring to market a speaker that magnificently embodies his own concept of what is important in music reproduction. These truly are products of his love, of both speaker design and music. And if the two speakers were natural competitors to each other? So be it. How to loose with more choices? My theory is supported by numerous conversations with speaker-meister Yun over the years. I can tell you that he takes as much -- if not more -- pride in this part of his line as he does in his dearer products. Having owned his Sonata MkII for three years, I don't blame him one wit. On one hand, he'll design a speaker like his Bolero, using premium drivers and parts which -- dare I say it? -- will appeal to the brand-conscious audiophile. Before I'm accused of maligning this segment of his line, the fact remains that he uses first-class drivers to deliver a premium product that sells for pennies on the dollar when compared to what other companies deliver a similar product for. And they sound good, too. Real good. 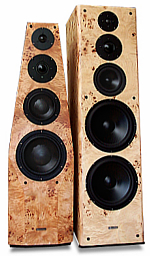 At the same time, Alan also builds a line of speakers from his heart -speakers that allow him to express his art. He builds those models with either transducers he makes himself, or drivers with little snob appeal that he knows will turn out an eminently musical product. And nowhere is this point made more evident than with the speakers under review: The Silverline Sonata MkIII. As compared to his MkII Sonatas (which I reviewed for SoundStage! before purchasing them) the Sonata III is, for most intents and purposes, a completely different speaker. The cabinet is smaller (43 x 12 x 12 inches), of a completely different shape and, at 110 lbs, 20 lbs. lighter. More robustly built, panel thickness varies from 2 to 2.5 inches and exceeds that of the MkII. Instead of its predecessor's dual 10-inch woofers, the 4-way Sonata III uses a single premium Dynaudio 9.5-incher that features an oversized 4-inch voice coil and double magnet structure. Bridging between midrange and woofer is a 7-inch Dynaudio mid-woofer replacing the SEAS of the MkII. On top, the Sonata III sports a new tweeter, the 1.25-inch Dynaudio Esotec, which Yun claims is several times more expensive than the LPG tweeter formerly used. But what keeps the Sonata III a Sonata is Yun's beloved 2" dome midrange by Germany's LPG. It's the heart and soul of the speaker. I suspect it's a driver he'll use for as long as LPG will produce it. New is the option of a black piano finish at no extra cost. Carried over from the MkII are the uncommonly beautiful Burled Briarwood and impeccable Rosewood finishes - all at unchanged prices. Lost are the old binding posts that I found difficult to use with thicker WBT spades. Gained are wonderful shrouded and easy to use WBT style binding posts [right]. My single caveat regarding the construction of the MkII Sonata has also been addressed. First, rather than the four spiked feet previously used, the MkIIIs use three. Second, the new spikes are longer, sharper and much better suited to stabilize the speaker on thickly padded carpet. 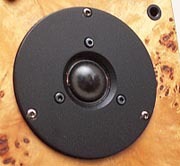 Three, the threaded inserts on the bottom of the speaker are more rugged now, though Silverline still strongly suggests finalizing placement before their installation. The heart of the Sonata may be the same, but it's been transplanted into a much younger body. That newfound youth comes with a more svelte silhouette and a healthy dose of athletic strength, speed and agility. It also comes with a heartier appetite for power. Silverline rates the Sonata III two decibels less sensitive than its predecessor. Given the MkII's 95dB very tube-friendly mien, that's a fairly significant change. But with a 93.5dB professed sensitivity and an impedance of 8 ohms (+/- 10%), the latest iteration is hardly difficult to drive. In fact, I found my recently acquired Art Audio Carissa and its 16 SET watts of understated muscle a good match. Silverline specifies a frequency response of 25Hz - 28KHz (+/- 3dB) and crossover points of 200/2000/4500. 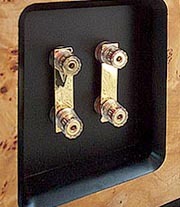 The tweeter uses a 6dB first-order filter, the mid a 12dB second-order, with again a first-order network on the midwoofer. Interestingly, Yun inverts phase for the dome midrange. He contends that the consequences of doing so are not what they would be with a cone midrange. Rather, here it increases dispersion to cast a wider, more spacious midrange. The woofer and midwoofer are vented to the rear [below]. One new and interesting touch for the MkIIIs are the black velvet sacks that protect the speaker finish from the hostile environment of mandhandled shipping boxes. Neat! The speakers are even shipped with the velvet pouch inside-out to have the finish veritably caressed by the plush nap. I had reason to believe that the review pair came with some sonic mileage on it. Upon arrival, I ushered them right into the listening room. To see these speakers in the flesh is to admire them not only for the impeccable finish, but also for the interesting shape and their room-friendly proportions. Due in large part to the narrowing shoulders -- resulting in a smaller baffle than before to eliminate surface reflections -- these speakers appear much smaller and more environmentally friendly than their predecessors. When lined up side-by-side [above], they in fact are far more similar in size than one would think. Still, the new version is visually much less obtrusive. By any standard, these are very handsome speakers. Sonically, the MkIII didn't overwhelm me at first but I later discovered that this was actually because they were nowhere nearly broken in. Out of the box, I found the bass response similar to that of my fully broken-in Sonata IIs. The midrange proved remarkably familiar but the treble was cut from a completely different cloth. Upon arrival, the tweeter sounded aggressive and edgy, completely out-of-step with the midrange as though in need of a dB or more of attenuation. In order to get back to prior reviewing obligations, the Sonata IIIs were promptly removed from the primary listening room and replaced by my Sonata IIs to make all things equal again for the amplifier under review. The Sonata IIIs went to another room and spent the next two weeks playing daytime FM radio. A few weeks after the initial listening session, the IIIs returned to the music room. Whoa! 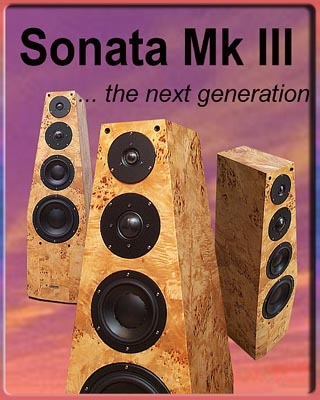 The Sonata III had morphed into a completely new speaker. The balance had so shifted toward the bass that a repositioning of the speakers within my room became mandatory. Sited where the IIs had been, the speaker sounded bass-heavy, slow and plodding. They eventually came to rest about a foot closer to each other and about a half a foot further into the room, putting the tweeter 42 inches from the front wall. There they sounded crisp, clean, fast, and powerful. In the past, Silverline has been criticized for being optimistic about their claimed bass response figures. Perhaps so - but not anymore. Despite what appears like a step back in available bass artillery, the new Sonata III produces serious bass to be reckoned with. Subjectively, it extends lower than my IIs and with more authority. It also does so with a more sophisticated air about it. More on this later.